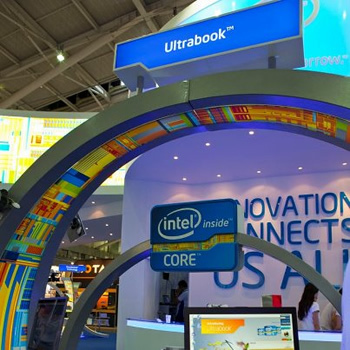 Intel is looking to bolster their Ultrabook offering even further by integrating a voice technology similar to Google Voice into future systems. General Manager of the Intel Architecture Group David Perlmutter told those in attendance at the Intel Developer Forum that his company was working with Nuance to develop the service. During the conference, an Intel developer showcased what they have been working on thus far. The company used a Dell XPS Ultrabook to search the Internet, look up a product on Amazon, tweet a link to it then play some music – all using voice commands, ZDNet said. The publication says the service will be similar to Google Voice which lets Android users control their handset and search the Internet using voice commands. They said the key difference between the two will be the initial interaction – with Android, users are required to touch the screen to begin. Intel’s product will let users activate the service using voice commands. Intel says the technology will run natively on the hardware instead of having to connect to a remote service like Apple’s voice assistant Siri. It’s able to accomplish that task by using the high-performance processors found inside Ultrabooks. Nuance is using their Dragon Assistant technology as a base for the service and will be working closely with Intel to ensure it doesn’t require too many CPU cycles. The companies say a beta should be available in late 2012 with a completed product shipping with Ultrabooks in the first quarter of 2013.